July | 2014 | The British in Crete, 1896 to 1913. Cretans play with fire; European Powers respond. European warships off Crete. 1897. 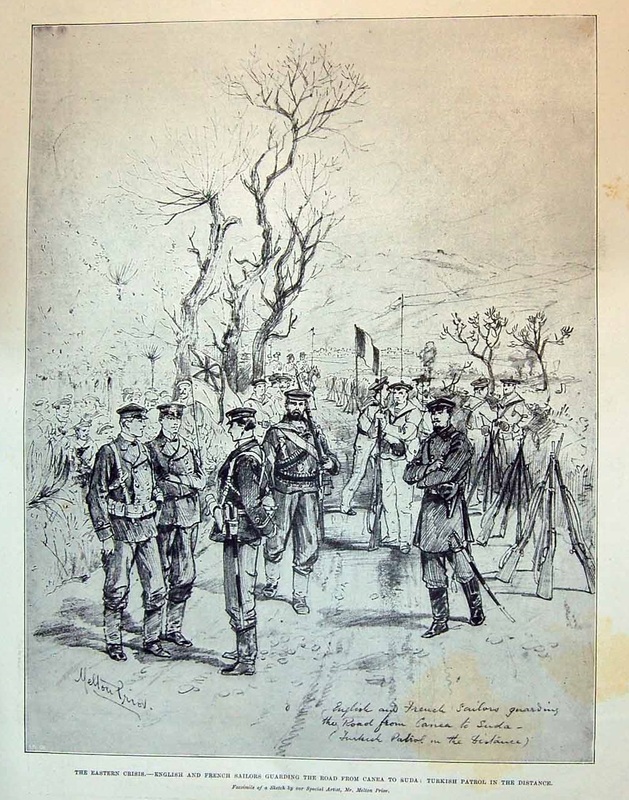 The illustration shows the events of 21 February 1897 when European warships opened fire on Cretan Christian insurgents who had hoisted a Greek flag and were threatening to bombard Canea from the hills above the town. In spite of being instructed to haul down the flag, Crete was then part of the Ottoman Empire and Greece was attempting to annex it without the consent of the European Powers who guaranteed the Greek and Ottoman borders, the Cretans refused. When it became clear that they possessed artillery, given to them by Greek troops who had landed in Crete a few weeks earlier, the Europeans opened fire on the insurgents’ position. After a few minutes firing from the warships the flag came down and the Christians withdrew. More details here. This entry was posted in European Intervention Crete, Naval on July 25, 2014 by Mick McT. Date, location and regiment unknown. 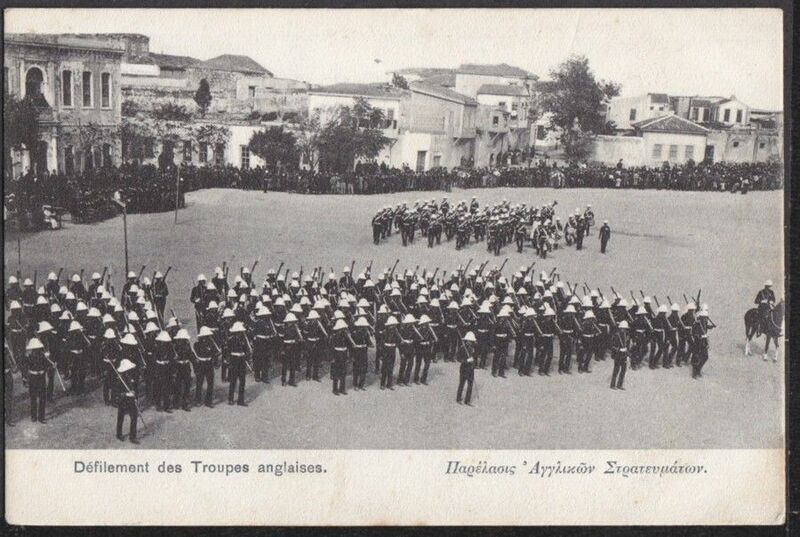 However, they have their band on parade so it’s likely to be in Candia (Iraklion) where the bulk of the British troops were stationed, rather than Canea where there was usually only a token force. This entry was posted in British Army in Crete and tagged parade on July 25, 2014 by Mick McT. British troops arrived in Candia in April 1897 but it wasn’t until the following year that huts were supplied for them…the delay was because the contract had to be put out to tender. Until the huts arrived, the men lived under canvas – although the officers naturally had permanent quarters. By 1907 permanent quarters had been provided. This entry was posted in British Army in Crete and tagged British Army, Candia on July 22, 2014 by Mick McT. This entry was posted in British Army in Crete, Uncategorized and tagged European Intervention Crete, King's Royal Rifles on July 20, 2014 by Mick McT. Three different views of the arrival of 1/Seaforth Highlanders in Canea, 1897. 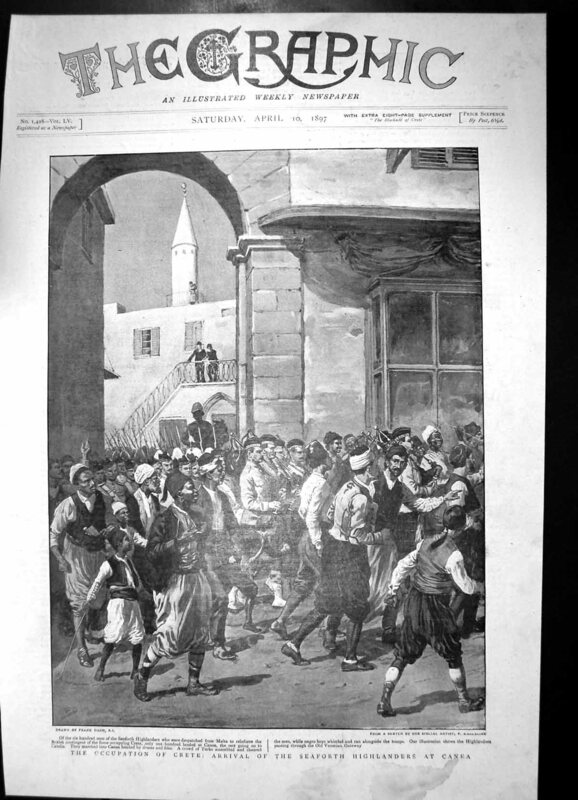 The Seaforths arrived in Crete on 24 March 1897. The name of the artist is indistinct. Of note is the presence in the foreground of at least one black Muslim (Cretan Christians would not wear a fez.) 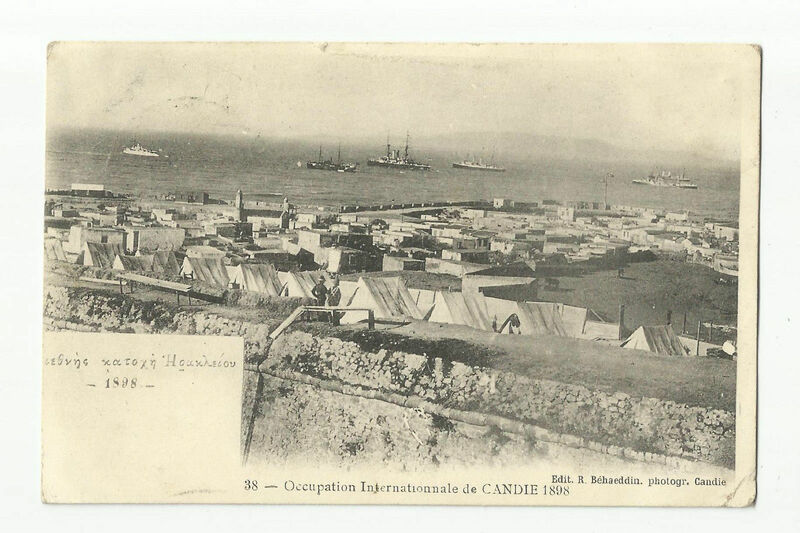 There was, at this time, an encampment of black Sudanese and ex Ottoman slaves just outside Canea. The men looking for work as day labourers, the women begging. All of them apparently Crete within a short period after the evacuation of Ottoman troops in November 1898. 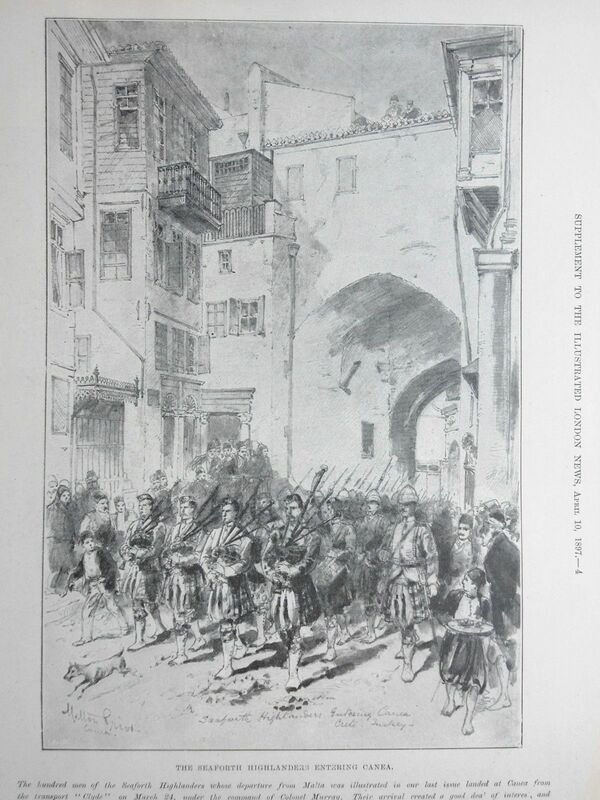 This engraving from The Illustrated London News, is taken from a sketch by the British artist Melton Prior who was in Crete when the Seaforths arrived. According to notes in the National Army Museum file on the Seaforths [NAM 6807], the officer on the right-hand side is Captain G. G. A. Egerton, D Company 1/Seaforths. Egerton was in charge of the Seaforths detachment in Canea, the bulk of the battalion being stationed in Candia (Iraklion). 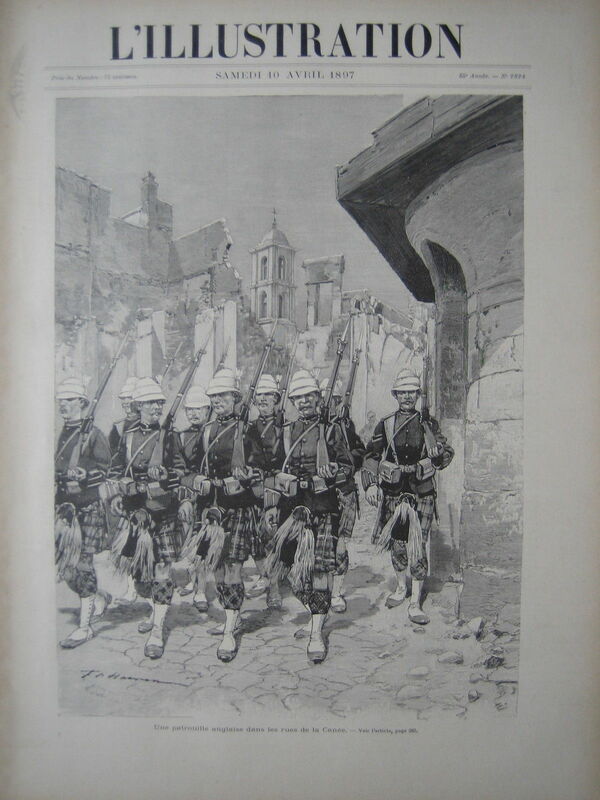 A French take on a Seaforths’ patrol. This entry was posted in British Army in Crete, Seaforth Highlanders and tagged European Intervention Crete, Seaforth Highlanders on July 16, 2014 by Mick McT. British and French Marines and sailors guarding Canea/ Suda road. 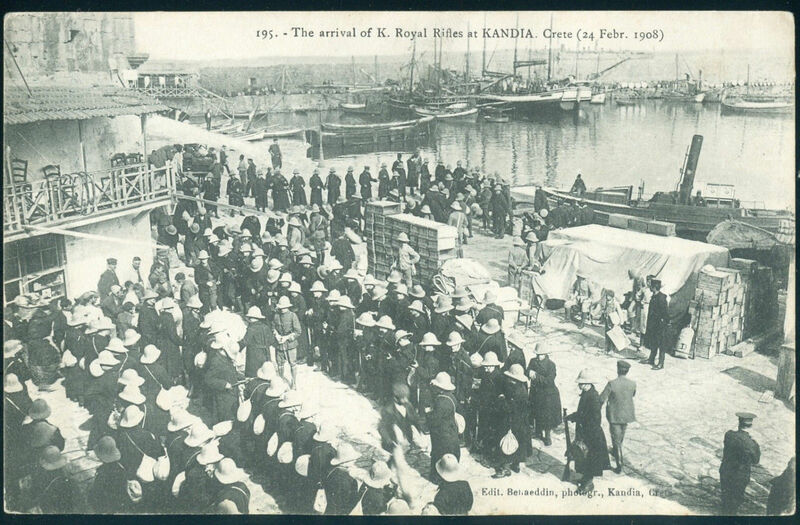 The initial British phase of the intervention involved landing Marines and Sailors in Canea on 15 February 1897. The illustration shows a joint British/French patrol keeping open the road between Canea, the then capital of Crete, and Suda Bay, the base for the European warships. 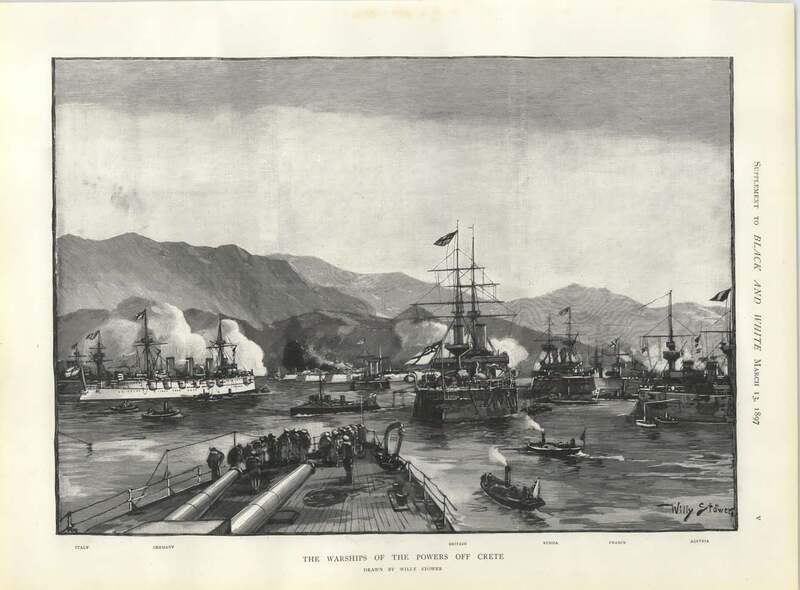 This entry was posted in Royal Navy in Crete and tagged Crete 1897, European Intervention Crete on July 14, 2014 by Mick McT. 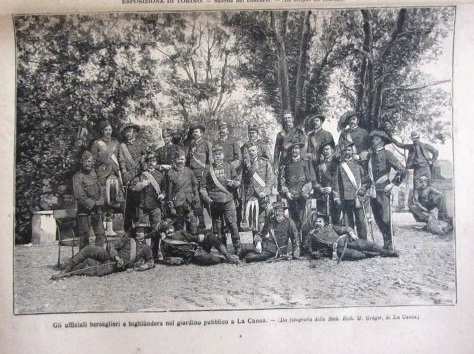 Seaforth Highlanders and Italian troops. 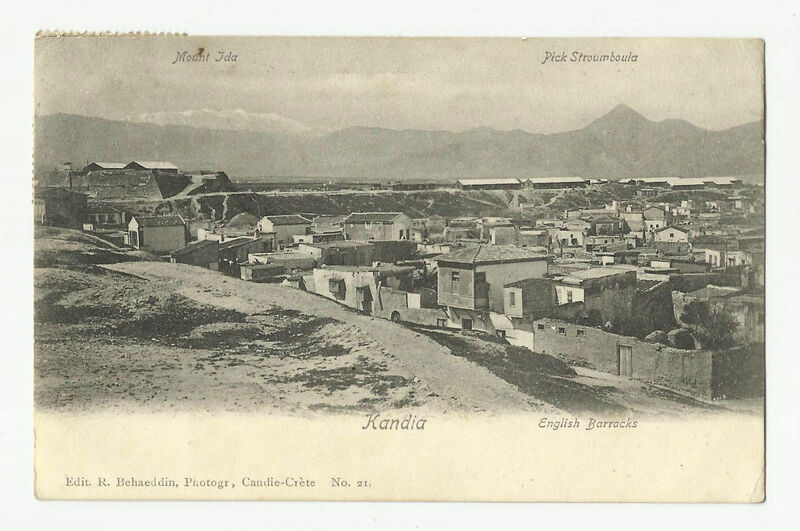 Canea 1897. Photograph from an Italian magazine. This entry was posted in European Intervention Crete, Seaforth Highlanders on July 4, 2014 by Mick McT.